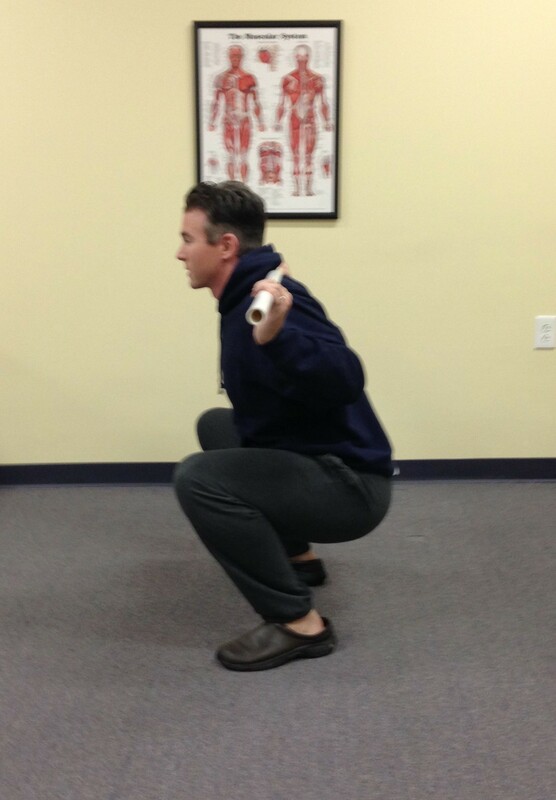 The squat is integral in many exercise programs focusing on health, rehabilitation, injury prevention, and performance. So why is this exercise valuable? May contribute to improved running economy.7 Running economy is how efficiently a runner utilizes resources, i.e., oxygen. Directly specific to many of our daily activities (e.g., getting out of a chair or lifting an object from the ground). It may take minutes to learn a bodyweight squat and in some cases weeks to properly learn a barbell back squat. It is not uncommon to have to work through flexibility issues, and in some cases strength deficits before performing the exercise optimally. Barriers to some common performance problems will be addressed in another article. 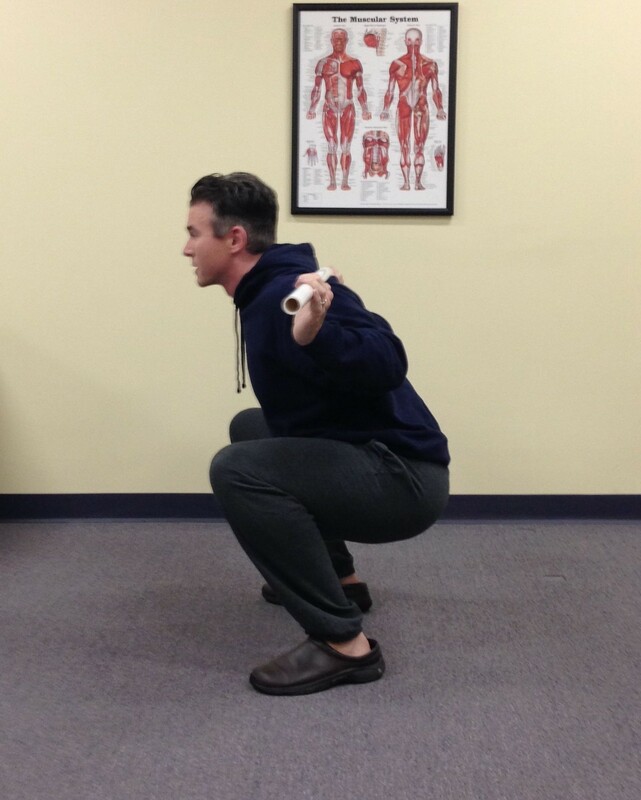 There are many variations of the squat. 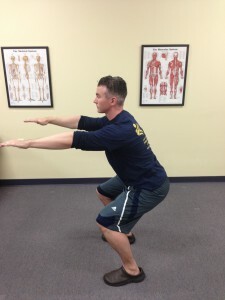 My intention is to focus on introducing the reader to the traditional bodyweight squat and barbell back squat. 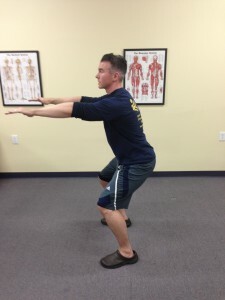 In most instances, the hip should break slightly before the knees. If there is difficulty initiating the movement at the hips, practicing the hip hinge may be helpful. Keep the natural curve of the back. 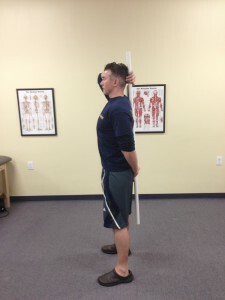 Think of how the back is held during the hip hinge. Deep Squat = greater than a 100-degree knee angle (A squat with the thighs parallel to the floor is considered a deep squat as the knee angle is >100 degrees). Regarding sport – Depth will likely change, depending on where the athlete is in their training cycle, but most athletes will benefit from focusing primarily on the deep squat. 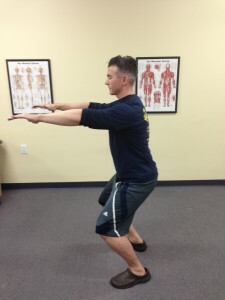 Regarding pathology – Those with posterior cruciate ligament (PCL) injuries may need to restrict themselves to partial squats (<60 degrees) to decrease excessive posterior shear force.1 The greater the knee angle during squatting, the more compressive forces are placed on the meniscus and articular cartilage of the knee.1 Someone with an ACL injury may not be off the hook as the meniscus is often damaged along with the ACL. 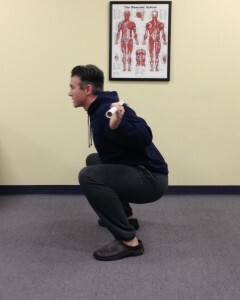 In many cases it is advisable that squatters dealing with a knee pathology limit themselves to a half or partial squat. Squat depth should be individualized, even in those who are healthy, based on factors such as the individual’s goals and physical status (e.g., flexibility,coordination). 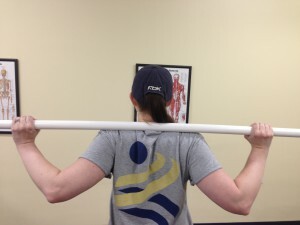 Low Bar Position – The bar sits on a “shelf” created by the contraction of the upper/middle trapezius and posterior shoulder. Traditionally the squat is performed in a fairly upright position; however, in powerlifting a more angled torso is common. The powerlifting squat typically utilizes a low bar position, and the traditional squat tends toward the high bar position. 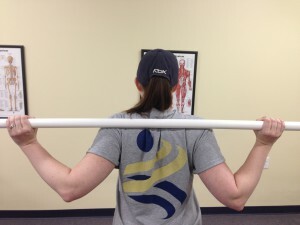 What if Hip or Groin Pain is Experienced? Get the source of pain diagnosed by your physician. 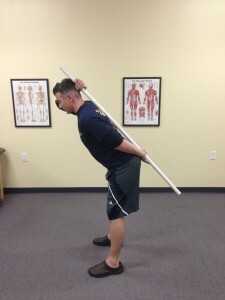 If the hip joint is the problem (e.g., labral tear, impingement, arthritis) consult with your physician or physical therapist to determine if the squat is an appropriate exercise. 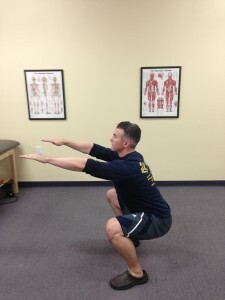 The squat is an unbelievably useful tool for almost anyone wanting to improve themselves physically. The exercise needs to be individualized. It is best to consult with your physical therapist so he or she can consider your individual mobility, strength, medical history, and goals. 1. Schoenfeld, Brad J. “Squatting kinematics and kinetics and their application to exercise performance.” The Journal of Strength & Conditioning Research 24.12 (2010): 3497-3506. 2. Clark, Dave R., Mike I. Lambert, and Angus M. Hunter. “Muscle activation in the loaded free barbell squat: A brief review.” The Journal of Strength & Conditioning Research 26.4 (2012): 1169. 3. Wisløff, U., et al. “Strong correlation of maximal squat strength with sprint performance and vertical jump height in elite soccer players.” British journal of sports medicine 38.3 (2004): 285-288. 4. Baker, Daniel. “Improving vertical jump performance through general, special, and specific strength training: A brief review.” The Journal of Strength & Conditioning Research 10.2 (1996): 131-136. 5. Kraska, Jenna M., et al. “Relationship between strength characteristics and unweighted and weighted vertical jump height.” Int J Sports Physiol Performance 4 (2009): 461-73. 6. Cronin, John, et al. “Does Increasing Maximal Strength Improve Sprint Running Performance?.” Strength & Conditioning Journal 29.3 (2007): 86-95. 7. Millet, GREGOIRE P., et al. “Effects of concurrent endurance and strength training on running economy and VO~ 2 kinetics.” Medicine and science in sports and exercise 34.8 (2002): 1351-1359. 8. Dickerman, R. D., R. Pertusi, and G. H. Smith. “The upper range of lumbar spine bone mineral density? An examination of the current world record holder in the squat lift.” International journal of sports medicine 21.07 (2000): 469-470. 9. Gagnier, Joel J., Hal Morgenstern, and Laura Chess. “Interventions Designed to Prevent Anterior Cruciate Ligament Injuries in Adolescents and Adults A Systematic Review and Meta-analysis.” The American Journal of Sports Medicine (2012). 10. Kibler, W. Ben, and Beven Livingston. “Closed-chain rehabilitation for upper and lower extremities.” Journal of the American Academy of Orthopaedic Surgeons 9.6 (2001): 412-421. 11. Deyle, Gail D., et al. “Physical therapy treatment effectiveness for osteoarthritis of the knee: a randomized comparison of supervised clinical exercise and manual therapy procedures versus a home exercise program.”Physical therapy 85.12 (2005): 1301-1317. 12. Comfort, Paul, and Peter Kasim. “Optimizing squat technique.” Strength & Conditioning Journal 29.6 (2007): 10. 13. Caterisano, Anthony, et al. “The effect of back squat depth on the EMG activity of 4 superficial hip and thigh muscles.” The Journal of Strength & Conditioning Research 16.3 (2002): 428-432. 14. Fry, Andrew C., J. Chadwick Smith, and Brian K. Schilling. “Effect of knee position on hip and knee torques during the barbell squat.” The Journal of Strength & Conditioning Research 17.4 (2003): 629-633.